As everyone heads back to begin the new school year, and as I resume my work on The Teacher Beacon, I thought that this would be an ideal time to share something special with you. As you know, we’ve all had them. They’re part of who we are, the teachers in our lives who motivated us to be better human beings. 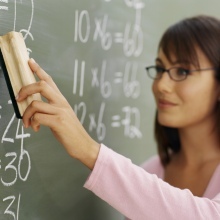 Is there an X-factor that makes a teacher extraordinary? Is there a special formula that teachers use to move students academically–and on to bigger futures? Each might use unique techniques–a conga line to teach division, for example– but together their love of teaching is potent and contagious. Here are some of the common traits (in the order that the researchers listed them) that great teachers share on education’s front lines. Laureen Martin, a fourth-grade reading and writing teacher from Pinedale Elementary School and one of the five 2012 Teacher of the Year finalist for Duval County, originally tried to run from her calling. But in an interview with a Teach for America representative during her senior year at the University of Florida guided her back. A fourth-grade reading and writing teacher from Windy Hill Elementary School, Chris Bacca says his students’ achievement begins and ends with him.